ELWOOD BEARINT was born in Philadelphia around 1906, the oldest child of Edward Bearint and his wife Clara. The family moved to the Cramer Hill section of Camden NJ around 1915, the elder Bearint working as a rigger in one of Camden's many shipyards. By the end of 1919 the family owned a home at 1019 North 26th Street. 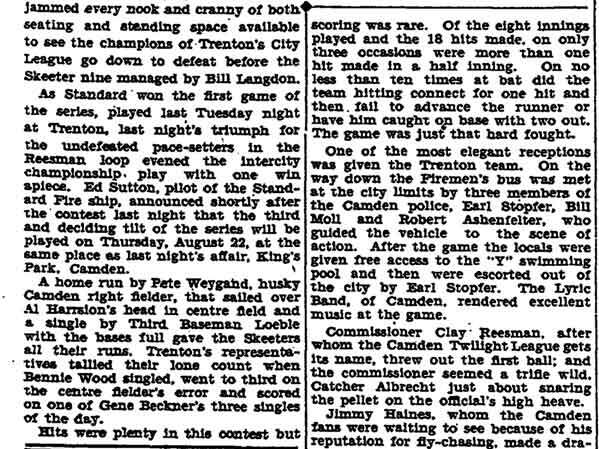 Elwood Bearint grew up playing a lot of baseball, and in his day was considered one of Camden's top players. 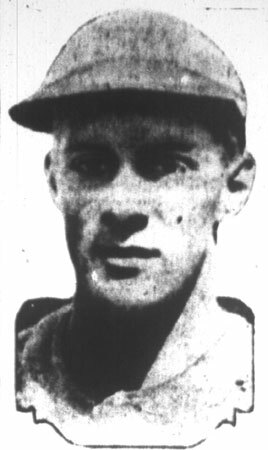 A left-handed pitcher who could also hit and play the outfield, he was signed by Connie Mack's Philadelphia Athletics and sent to one of their minor league affiliates. 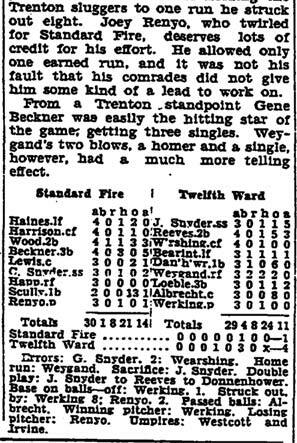 Unfortunately, an injury to his pitching arm ended Elwood Bearint's days as a pitcher and major league prospect. He was a fixture for years in the semi-pro leagues in and around Camden, and was a member of Cramer Hill's famed Defiance Athletic Club baseball team. 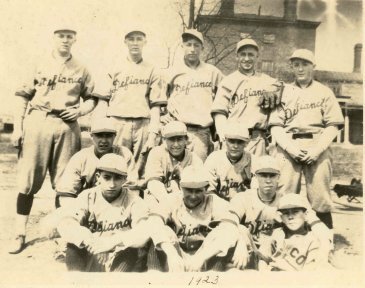 The 1923 Defiance team, won 32 games against only 8 losses and three ties. 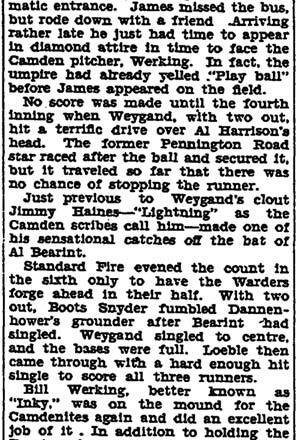 His younger brother, Paul Bearint, also was well known in Camden semi-pro baseball. Paul Bearint was signed by the Yankees and he roomed with Yogi Berra in the minors, and played four seasons in the Philadelphia Athletics farm system. Another brother, Chuck Bearint, also played minor league baseball just after World War II. Elwood Bearint went into the roofing business. He worked out of his home at 950 North 33rd Street in Cramer Hill, where he lived with wife. the former Marie Mayer, and children David and Anne. 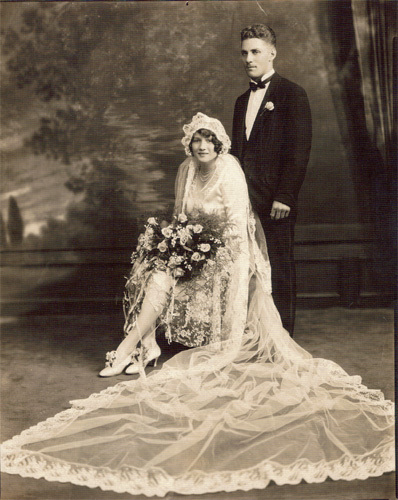 Elwood Bearint was in Bellmawr NJ on business when he died from an aneurism on August 30, 1954. Elwood Bearint, 48, a roofer and sheet metal worker, who was active in Camden semi-pro baseball a number of years ago, died on Monday afternoon. He was stricken while on business in Bellmawr, and was taken by the Bellmawr Fire and Rescue Squad ambulance to the West Jersey Hospital, where he was pronounced dead on arrival. 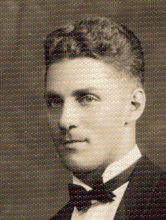 Mr. Bearint was a native of Philadelphia and lived in Camden 39 years. His home and office were at 950 North 33rd Street. At one time he was a mechanic in the Camden police garage. He was a member of Trimble Lodge, No. 117 Free and Accepted Masons. 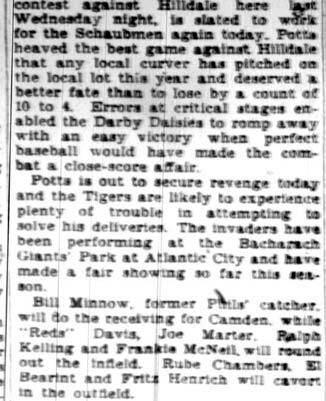 Mr. Bearint began his baseball career in the section of Camden known as Cramer Hill when there was a baseball field in every block. He was a southpaw pitcher and also played in the outfield. 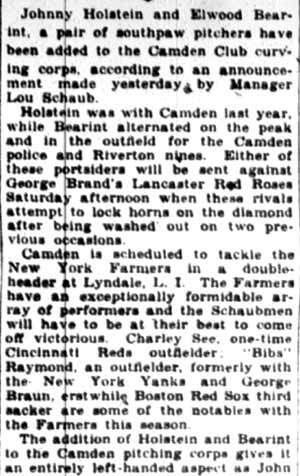 He attracted the attention of Connie Mack and he was sent to one of the farms of the Athletics. His future in the big leagues seemed assured until an accident to his arm destroyed all chance as a moundsman. 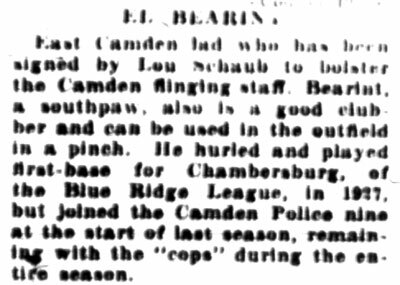 When the Camden police baseball team was organized, Mr. Bearint was asked to join it, and he was one of the biggest assets the team had. 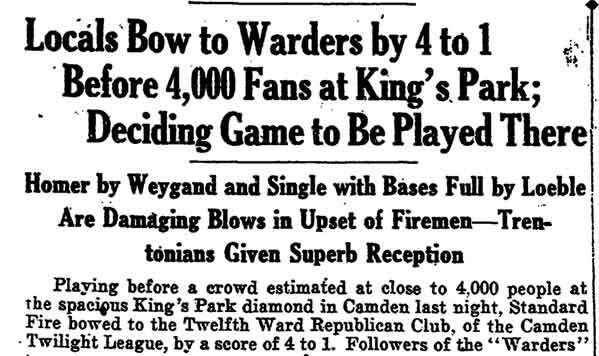 His powerful hitting attracted the attention of several minor league scouts and he received many tempting offers which were refused as he preferred to end his baseball career on the lots where it had started. 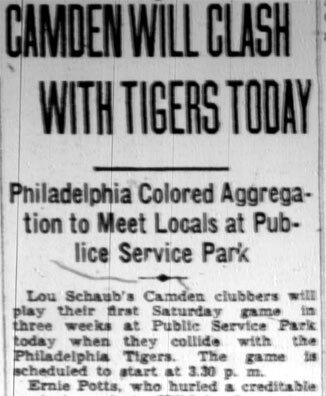 He had played on the old Defiance Team, the Camden East Side A.A. team in the Camden County League, and with the Twelfth Ward and the Riverton teams. 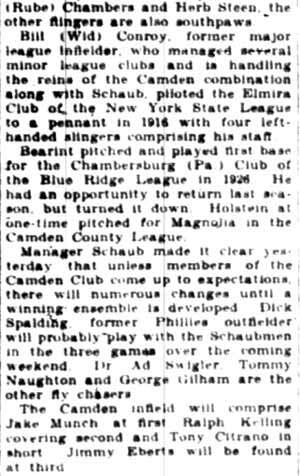 He also had played with Chambersburg PA in the Blue Ridge League. He also had played baseball with York PA, and had played basketball with the Defiance team in Camden and with Camden Police. 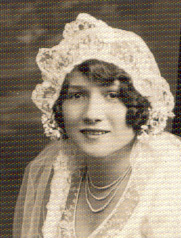 Surviving are his widow, Marie A.; a son, David E.; a daughter, Miss Anne M.; his father, Edward, of Wildwood; four brothers, Edward J. of Brooklawn, Howard of Ocean View, and Pal M. and Charles of Camden, and six sisters, Mrs. Tina Hopkins, of Gloucester, Mrs. Katherine Glander, of Blackwood; Mrs. Claera Shinn, of Haddon Heights; and Mrs. Margaret Hoffman, Mrs. Lillian Seidelman, and Mrs. Rose Baltake, of Camden. Services will be held 1:00 PM Friday in the Davies Funeral Chapel, 4522 Westfield Avenue, Pennsauken, where a viewing and Masonic services will he held Thursday night. Burial will be in Locustwood Memorial Park.